One of three projects within a converted factory building in Clinton Hill, Brooklyn. The original structure, dating from 1911, has an oak post and beam frame with a brick exterior. Each apartment has a different relationship with the structural grid, often creating challenges and opportunities at the same time. The Griesinger Apartment involved a gut renovation of the kitchen and laundry room, opening up the adjacent living room and new closets in two locations. The new open kitchen relates directly to the dining space and speaks to the living area beyond. The existing oak column was exposed by removing full height closets, and now provides a punctuation point between the two spaces. The new floating ceiling defines the kitchen, with reveal details where this plane meets the walls. 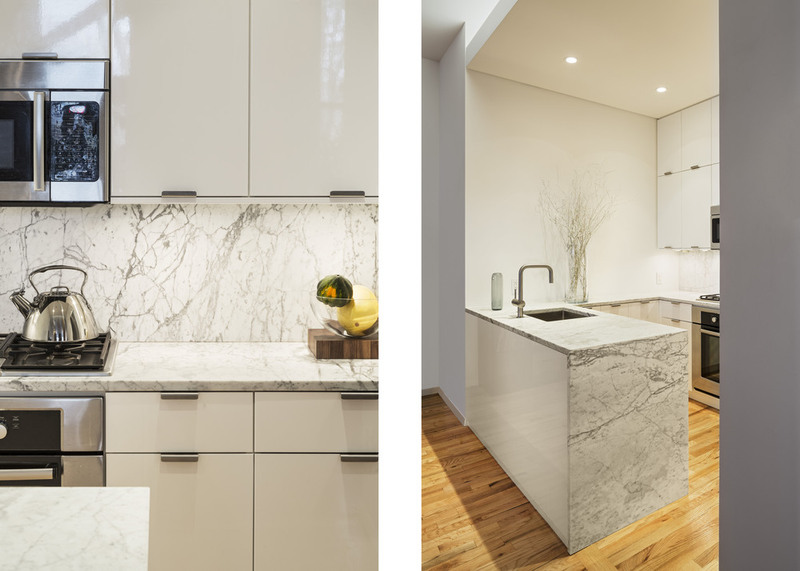 Finishes are kept to a crisp palette of whites, with Carrara marble counters and a natural finish for the oak column and flooring.